Listen to a beam of light. Audio signals can be carried by radio waves or as electrical pulses in wires. Other forms of electromagnetic radiation, such as visible light, can also carry audio signals. 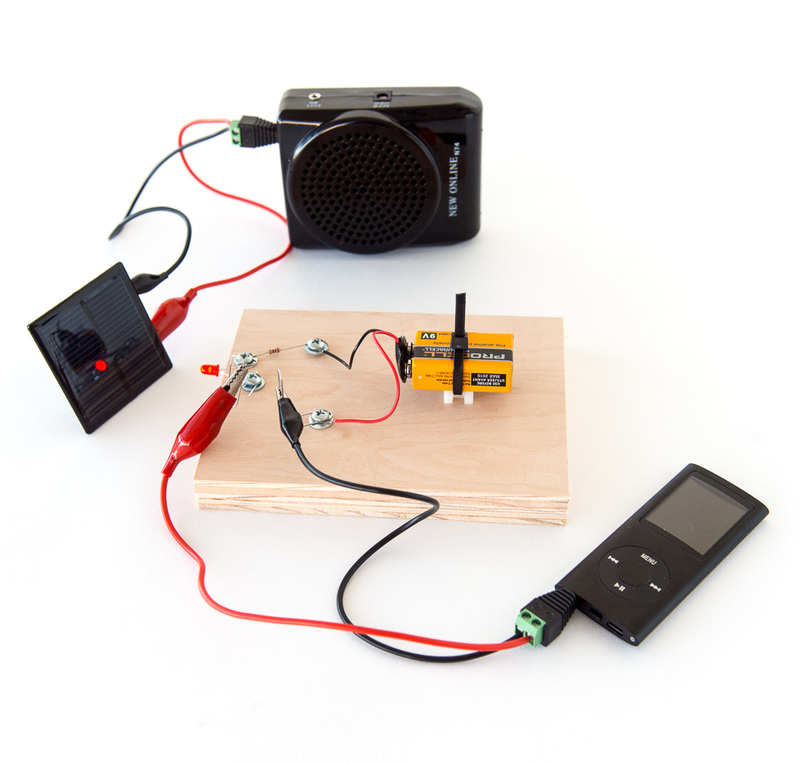 In this Snack, you can build a simple device that will transmit audio signals from a radio or digital-music player via a blinking LED to a solar cell. Use wire strippers to cut one of the two alligator test leads in half. Strip the cut ends to expose approximately 1/4 inch (6 mm) of the wire. If the wire is composed of strands, twist them together to make them neater. Insert the stripped end of the lead into the terminal block of the 1/8-inch (3.5-mm) connector and screw down tightly using the miniature screwdriver. Insert only bare wire into the block. Repeat with the other half of the cut test lead. Connect the alligator clips to the terminals on the solar cell. Insert the 1/8-inch (3.5-mm) connector into the microphone jack (input) of the voice amplifier speaker. To test if the receiver is working, turn on the voice amplifier and place the solar cell under a set of fluorescent lights. Many fluorescent lights flash at about 120 Hz, so you should hear a steady buzz from the speaker. Alternatively, you can shine a flashlight onto the speaker. Flash the light on and off. You should hear a click from the speaker each time the light goes on or off. 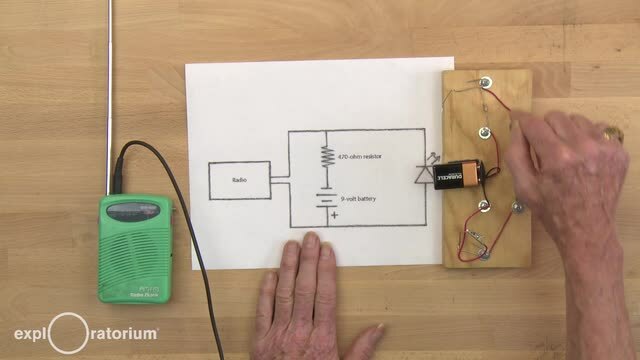 Once the receiver is working, set it aside and build the transmitter. Note: Though we’ve never damaged a digital music player or cellphone with this arrangement, there is a risk that directing DC current through the headphone jack may affect internal components. Some modern devices have safety mechanisms that prevent the player from working if this happens (in which case this Snack will not work). If a small 100µF or 10µF capacitor is wired in series with a paper clip, it will reduce the risk of DC current entering the headphone jack. Carefully bend the paper clips until they form an “L,” as shown below. Place a washer onto a sheet-metal screw and then wrap one end of the 470-ohm resistor around it (either side will work). Also, wrap the negative (short) leg of the LED tightly around the screw. Use the #2 screwdriver to screw the arrangement to the wooden board so that the LED sticks off the edge of the board, as shown in the photo below. Place a washer onto another screw. Wrap the other side of the resistor to the screw. Strip 1/4 inch (6 mm) of insulation off the wire from the negative (black) side of the 9-volt battery connector and wrap it around the screw. Screw it to the board. Place a washer onto another screw. Wrap the other (long, positive) leg of the LED around the screw and push the screw through one hooked end of a bent paper clip. Screw this to the board as shown. Place the last washer onto the next-to-last screw. Strip another 1/4 inch (6 mm) of insulation off the wire from the positive end of the 9-volt battery connector. Place the other bent paper clip over the screw and attach to the board. 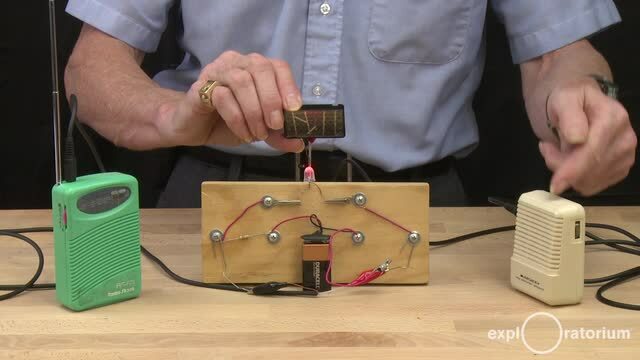 Connect the 9-volt battery to the battery holder. Screw the cable tie to the board as shown in the photo below. Then tighten the cable tie around the battery. Push the mono plug of the transmitter into the headphone jack of the digital music player or radio. The LED should light up. Turn the volume to just under the highest level. Play a song that is consistently loud, and set the player on repeat. Hold the solar cell about 12 inches (30 cm) from the LED, and point it directly at the LED. Turn on the voice amplifier speaker. You should now be able to clearly hear the music from the player through the amplified speaker. If you have difficulty, or if there seems to be significant static, block peripheral light from hitting the solar cell, or turn off the room lights if possible. What happens to the music if you put your hand between the LED and the solar cell? 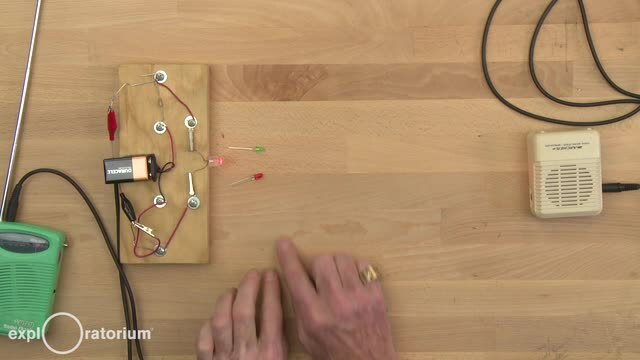 What happens to the sound if you move the solar panel farther from the LED? Try reversing the connections on the LED. Does the LED stay illuminated? The battery provides a steady DC current to light the LED. Under the influence of the battery alone, the LED glows at a fixed brightness. The resistor limits the current so the LED doesn’t burn out. When the music player is turned on, it puts out a weak but changing electrical signal via the headphone port. Normally, these signals would make the headphone’s speaker vibrate, but here the signal makes the LED flicker. The LED may not look like it’s flickering, since most people cannot see a change in brightness if it happens more than 18 or so times per second. Most songs have frequencies between 40 Hz and 18,000 Hz, so the flickering will be happening too rapidly to notice. The flickering light hitting the solar cell causes it to generate an electrical signal that will vary in synchronization with the flicker of the LED. 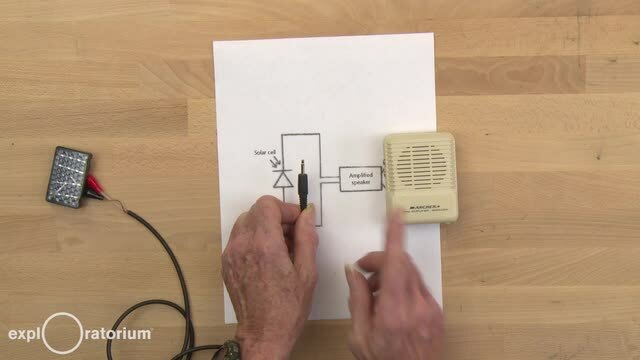 This signal is amplified and fed to the speaker, recreating the original sound from the music player. Placing an opaque barrier like your hand between the LED and the solar cell cuts off the light, so the solar cell is unable to generate the varying signal. Modern communications systems, such as long-distance phone lines and high-bandwidth communication lines for computers, commonly use modulated light signals. The relatively high frequencies of visual light can carry a lot more information than lower-frequency radio waves. The light used is normally from a laser, not an LED, and the signals are carried by a clear fiber-optic cable, rather than through air, but the principle is the same.